Imagine the horror effect running through your veins, when you are crossing a bridge suspended high above an abyss, with only two ends connected to ground. So narrow that only one person can walk and even a swirl of wind can shake the whole bridge. This is something that defines the concept of terrifying and scariest bridge. Generally, Bridges are meant to fill gap between two ends and make them easily accessible. But some bridges scare the hell out of the passers due to their height or because of their dilapidated condition. Let’s now take a look at world’s top 10 Terrifying Bridges around the World. Situated within a theme park, Royal Gorge Bridge was the Higest Bridge in the world from 1929 to 2001 until it was outranked by Liuguanghe Bridge in China. The bridge is situated above Arkansas River near Canon city in Colorado. The 291 meter high bridge is a tourist attraction and is 384 meter long. The bridge is suspended with the help of 46 meter high towers. In June 2013, the park was devastated by the fire with minimal damage to the Bridge. 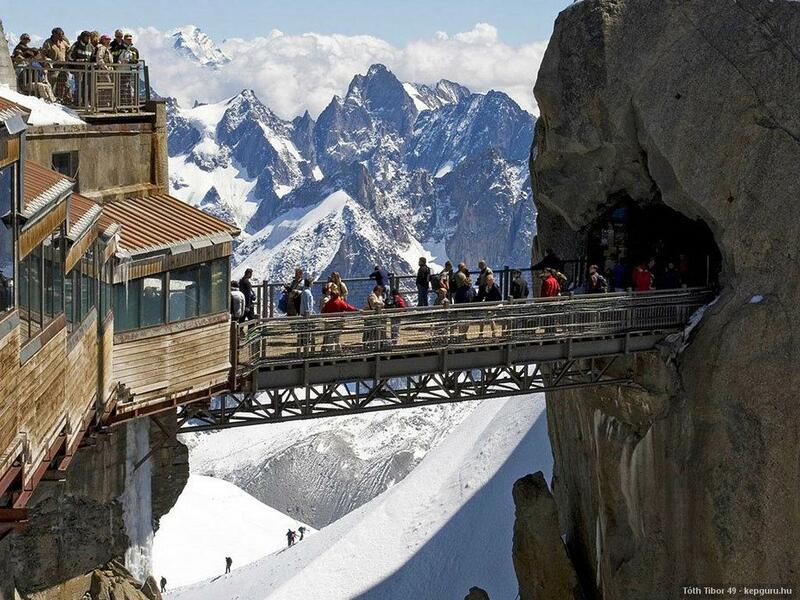 Aiguille Du Midi, meaning Needle of the Mid-day, is a mountain in the Mont Blanc Mountain range in France. The bridge is short but in order to reach the bridge one has to take a 9,200 vertical feet cable car. The bridge is at the height of 12,605 feet above sea level. The bridge is surely not meant for Acrophobic and also one cannot dare to look down from this height. The Ojuela Bridge was constructed by the same people who made plans for Brooklyn Birdge. The bridge is suspended at the height of 70 meter with the help of two supports at each end called stirrups. The total length of the bridge is 318 meter, which leads to the abandoned mine named Ojuela, which is now known as Ghost Town. The scary thing about the Bridge is the wooden plank floor that gives a creepy feeling while crossing the bridge, when one can see the desert canyon below. Known as “The Bridge of Death”, Quepos bridge is one of the decayed bridge that seems incapable of supporting even a Bicycle. Still, many lorries weighing tones cross the bridge on daily basis, driving from Jaco to Quepos in Costa Rica. At first sight, it seems that Bridge would collapse any moment. The Bridge so narrow that Four Wheelers can travel at one direction only. While the vehicles cross the bridge, the loose slats shake due to the weight of the motor vehicles. 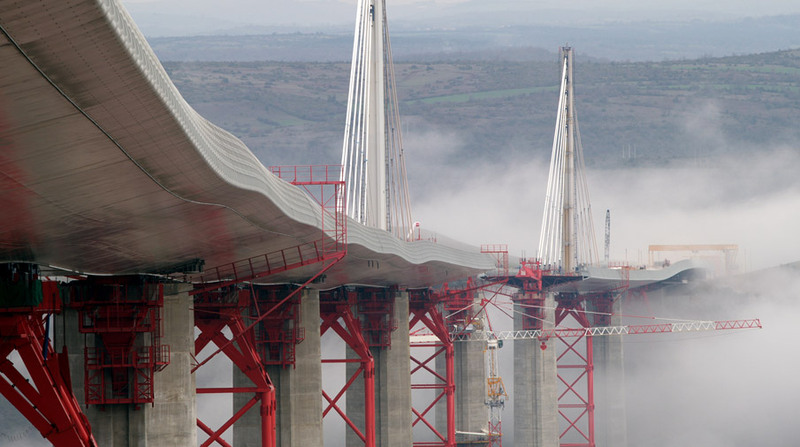 Any engineers dream, the Millau Viaduct Bridge is a cable-stayed Bridge and also tallest vehicular Bridge is the world. It is also the 12th highest Bridge In the world and crosses the Valley of River Tarn. The bridge extends to 2,460 meters and is a four lane crossing. The crossing connects Paris to Montpellier and is one of all the masterpieces of civil engineering. it was opened to traffic on the December 16th, 2004. It seems like one is driving in the clouds while driving on the Millau Viaduct. Vitim River Bridge is an old railway Bridge over the Vitim River, a major tributary of Lena River in the eastern Siberia. The bridge is barely 50 feet above the river water but what makes is dangerous is that it has no railings on both its side and only one wrong move can send you plunging 50 feet into the water. Also the passage is wide enough only for a car to pass. During winter, the wood planks turn into ice slicks. Commonly known as Titlis Cliff Walk, Mount Titlis Bridge is situated in the Swiss Alps, along the cliff of Mount Titlis. It is a pedestrian Bridge suspended at a height of 3,041 meters above sea level. The cliff walk is just 100 meters long and one meter wide. It gives a spectacular view around and the abyss below it is breathtaking. It is one of the highest suspensions in the world and holds the tag of the highest suspension bridge in the Europe. One needs to have the steel nerves to conquer it. One needs to to take a cable car in order to reach this 125 meter long unique curved bridge. Langkawi Sky Bridge was built in the year 2004 in Malaysia and is located at the Peak of Gunung Mat Chinchang Mountain at a height of 700 meter above sea level. The bridge stands closed for last 2 years and is uncertain about it opening again. Canopy Walkway in Ghana lies within the Kakum National Park and the only Walkway in national parks of Africa. 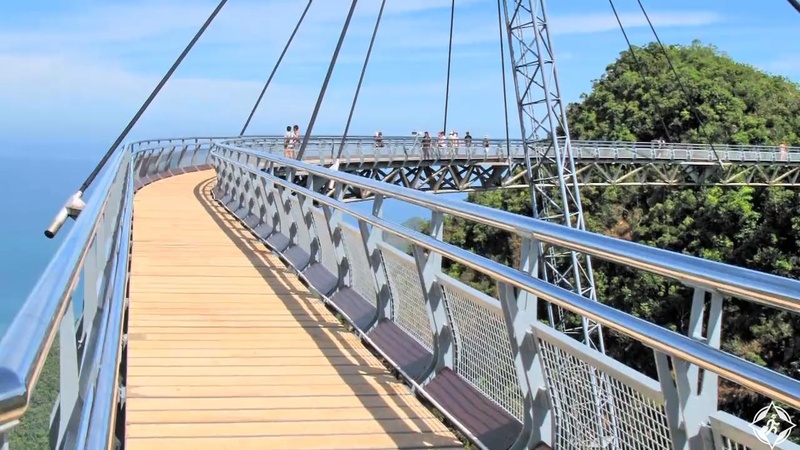 The walkway is connected with seven treetops, extending to 350 meter, providing access to the forest. The walkway is at height of 40 meter and allows the visitors to experience the forest from a monkey’s perspective. The bridges is just one foot wide plank of wood with hand rails and net walls on both sides. 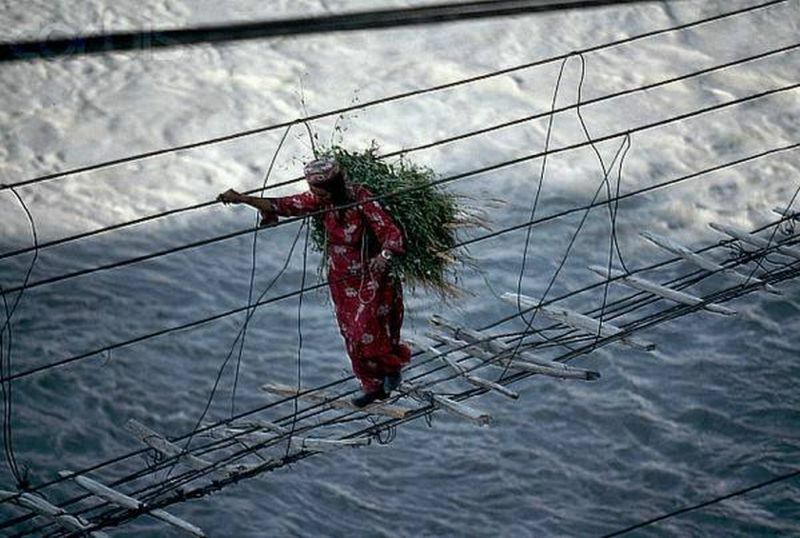 Known as world’s most dangerous bridge, Hussaini Hanging Bridge is absolutely hideous. The bridge is located in a village in the northern Pakistan, above Borit Lake in upper Hunza River. 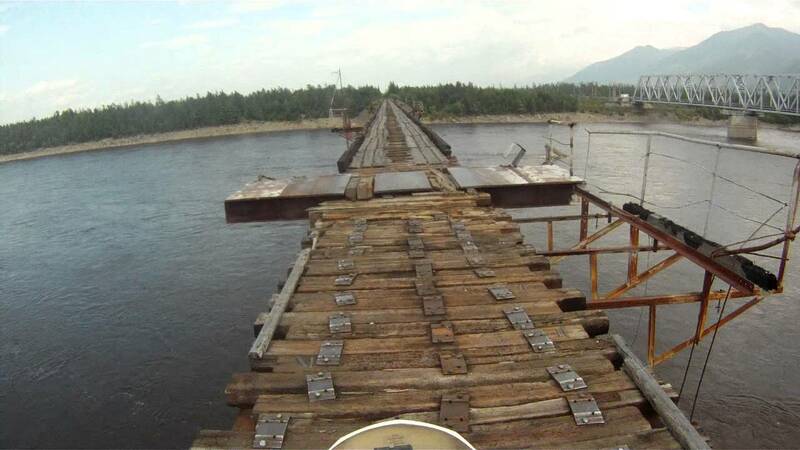 The bridge is too old, the planks are unstable and there are massive gaps between the planks. Reportedly, flood water submerged the Bridge into the water. The older tatty bridge hangs next to the new one, as if to make one feel what might happen while crossing the bridge. I have to say I really enjoy ready these top ten lists! You would not catch me on any of these bridges EVER! The one in Mexico and Pakistan are really terrifying for my sight. I can’t believe that these bridges are still being used every day. Those bridges in France are really incredible and gorgeous. Your lists are always interesting. Wow this is fascinating! I would love to explore these bridges! Oh, No thanks! I can’t stand of the high place. But these places are really beautiful.. I would try Millau Viaduct Bridge in France, seems awesome!! 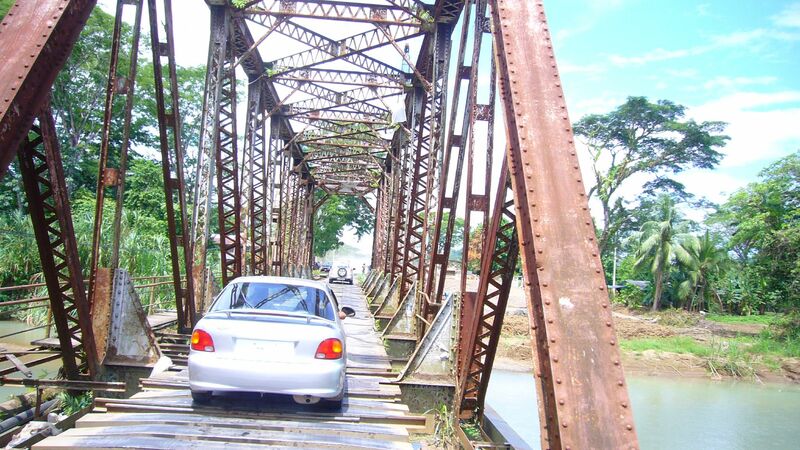 Any car fell from the Quepos bridge yet? The Pakistan Hussaini Bridge is indeed scary… People with heights, I don’t think they will ever be able to go through any of them! Some of these bridge are also scenic and have nice views from the top. The bridge in Pakistan looks really tough. Yes, truly, bridges were built for humans to use, but sometimes, it failed and accidents happened. Well, as we are appreciating its usage, we are all aware of its dangers. There are a lot of similar bridges with 5 and 7 here in the Amazon that I have to drive over because of my work. And a lot of them are a lot more scarier. The number 7 is still a good brinde. It has metal sideboards. What a hate is driving my truck over the nr 5 bridges, especially when they are not really solid and start to move around. I am Malaysian, but yet to been to the bridge in Langkawi. Recently saw the local news, it is opening again in this month. I was lucky to have been able to go on the bridge in Langkawi. The sight from above is absolutely gorgeous! The Pakistan bridge is really scary but I’m glad they have built a new one! Wow, all of these bridges seem so amazing but they do scare me for true, I would not dare walk on them. However, they are so beautiful to watch at! Wow! a good list. I had privilege to go to the huseini bridge this year. It is a wonderful place.